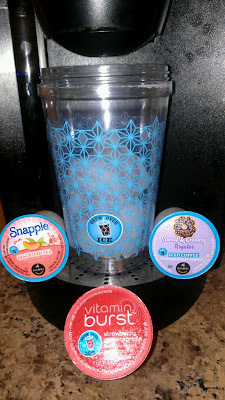 When my Brew Over Ice K-Cup samples and tumbler arrived, I couldn't wait to try them out! I had made iced coffee with my Keurig before, but never with k-cups that were actually specifically made for such brewing. 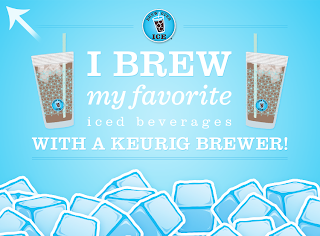 "Brew Over Ice K-Cups are specially blended to ensure a great tasting, refreshing iced beverage, every time. 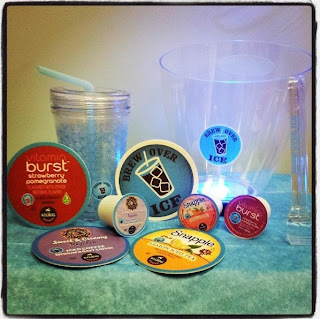 Look for the “Brew Over Ice” seal on your favorite blends from your favorite brands." Lets just say that their Brew over Ice varieties were simply delightful and have quickly moved to the list of my personal favorites! In a matter of minutes I can enjoy a variety of my favorite iced beverages including coffee, Snapple peach iced tea, and Acai Berry Vitamin Burst! Keurig has partnered with some of the world's finest coffee roasters to offer over 200 varieties of K-Cup and Vue packs for gourmet coffee, tea, and hot cocoa. What is your favorite? Don't forget to download your $2 off coupon and watch their Brew Over Ice video. In additions... be sure to grab your Free Snapple Brew Over Ice K-Cup Sampler Pack while supplies last! Click the "Brew Over Ice" badge below and enter the "Brew Over Ice Sweepstakes" - Play every day for your chance to win instant daily prizes and the $10,000 grand prize. This giveaway will end September 12th at Midnight EST. 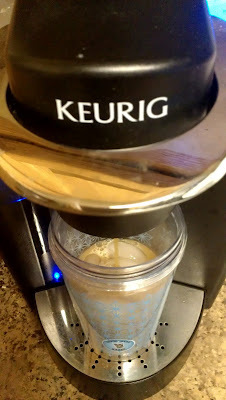 Disclaimer: The Being Frugal and Making it Work family received a complimentary Keurig Brew Over Ice Prize Pack for the purpose of writing a review and hosting a giveaway. Regardless, I only recommend products or services I would use personally and/or believe will be a good fit for my readers. The views and opinions expressed on this blog are based purely by our own experiences. No monetary compensation was received. Results may vary. I would love to try the Raspberry Iced Tea.. I drink the peach all the time and love it! I'd like to try Vitamin Burst: Strawberry. The Snapple Peach Iced Tea sounds delicious! I have already tried the half and half and love it! Would also like to try the Lemonade one also! 10,000 is big money! Who wouldn't want to win the contest! The Brew Over Ice variety I would most like to try is the Raspberry Iced Tea. The raspberry iced tea sounds wonderful. I like that they branch out and give the option of brewing things other than coffee. Any of the snapple ice tea's sound delicious, especially the rasberry one! I entered the sweepstakes and I want to win this contest mostly because I just love winning things. I most want to try the Donut Shop Sweet & Creamy Hazelnut iced coffee. I want to win because I would be able to pay off a lot of bills with that money. I could also buy groceries and some things that I need for the house. I would love the Donut Shop Sweet N Creamy flavor or the Southern Sweet Iced Tea. I've been playing in the sweepstakes and won some K-cups. I can't even imagine what would happen if I won the money, but I am sure it would be fun to have since I've got kids in high school and college. 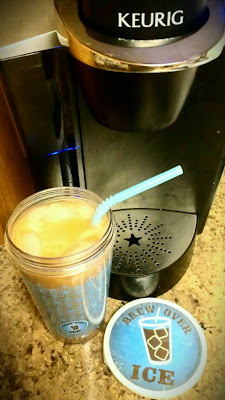 I would love to try the Sweet & Creamy Regular Iced Coffee, but I think I would add a little caramel to mine too! I would like to try the Unsweetened Black Tea. I drink a lot of tea and would love to be able to make a fresh glass whenever I want one. winnning the cash prize right now at this certain time in our life would just be amazing. with a baby/hospital bills on the way and an expensive summer on the credit cards would be such breath of air. I would love to win the brew over ice sweepstakes to help pay bills and to help with the expenses of a newborn baby. Especially since my husband is the only one working right now. I have a Keurig I got last year and while we've been having lots of fun with it, the new brew over ice sounds great in the warmer months! I would love to try the Lemonade flavor. Such a hard decision! Some I know ill love and others sound interesting lol I guess im going to say the one I want most is the lemon iced tea! I would like to try the Snapple lemon iced tea. I think that it would taste delicious. Mmmm...the Peach Iced Tea sounds wonderful! I love flavoured iced teas, so this would be great. I would love to win this because it would make it so much easier to enjoy delicious teas at home. I would love to try the original Donut shop sweet n creamy regular iced coffee and the sweet n creamy nutty hazelnut iced coffee! They sound delicious and it would be great if i could find an iced coffee.i.could fall in love with at home rather than buying coffee out all the time...adds up very quick!! Wow that's a great contest! I wish I had known about it sooner. Thanks for the chances! I would love anything sweet! The French vanilla iced coffee or maybe one of the teas!